In a world where Disney increasingly owns everything, Laika Studio's latest stop-motion animation feature, Missing Link, is a refreshing change of pace from that studio's formula. Per usual, the film -- following preceding Laika offerings The Boxtrolls and Kubo and the Two Strings -- is meticulously visually detailed and thematically dense, with a deeply moving message about belonging and stupendous visuals that take us from the New American West to the snowy Himalayas. Missing Link starts with a thrilling discovery: Sir Lionel Frost (voiced by Hugh Jackman) has found the Loch Ness Monster, has used his wits and his knowledge to attract the beast, and has taken a photograph of the creature to prove his discovery. What an amazing achievement! And then the monster breaks his camera, the evidence is lost, and his assistant quits. Lionel has already squandered much of his family's fortune and developed quite a rakish reputation, but he's determined to make a name for himself as an explorer, so he sets a goal: He will find the Sasquatch creature, and by proving its existence, he will secure entry into an elite adventurers' club led by Lord Piggot-Dunceby (voiced by Stephen Fry). But there's a rift between Lionel -- who believes in evolution, and is convinced that the Sasquatch is the "missing link" between our ape ancestors and ourselves -- and Piggot-Dunceby, who refuses to accept the scientific evidence. So although Lionel travels to the American West to find the creature, he is unaware he's being tracked by an assassin, who has orders to take out both Lionel and the creature. Which is unfortunate, because the Sasquatch -- who Lionel names Mr. Link (voiced by Zach Galifianakis), is quite charming! He speaks English, he's well-read, he's polite, he knows who Lionel is, and he's lonely in the Pacific Northwest all by himself. As humans keep expanding into nature, Mr. Link's home is disappearing. So he asks Lionel to help him travel to the Himalayas, where he thinks the legendary Yeti creatures may be his cousins. And to get there, Lionel and Mr. Link will need help from an old flame of Lionel's, Adelina Fortnight (voiced by Zoe Saldana), who is grieving the death of her husband but is interested in reclaiming her own adventurer roots. Missing Link benefits greatly from this excellent voice cast. Jackman brings charming haughtiness to his role, a mixture of curiousity and imperiousness that works well to transmit the dueling motivations of Lionel Frost. Galifianakis brings a lively sincerity makes Mr. Link almost immediately lovable, even as his clumsiness sometimes puts their group in danger. And although Saldana doesn't have as much to do with Adelina, she demonstrates a gentleness toward Mr. Link that is in direct contrast to Lionel and helps the adventurer move toward a greater understanding of the Sasquatch's experiences. Every location is gorgeous and lush and detailed; the film smartly contrasts the worldview of Lionel's adventurers' club with the Yetis they eventually meet in the Himalayas in order to describe two different ways of approaching life; and the film's gentle humor helps keep its pacing brisk. 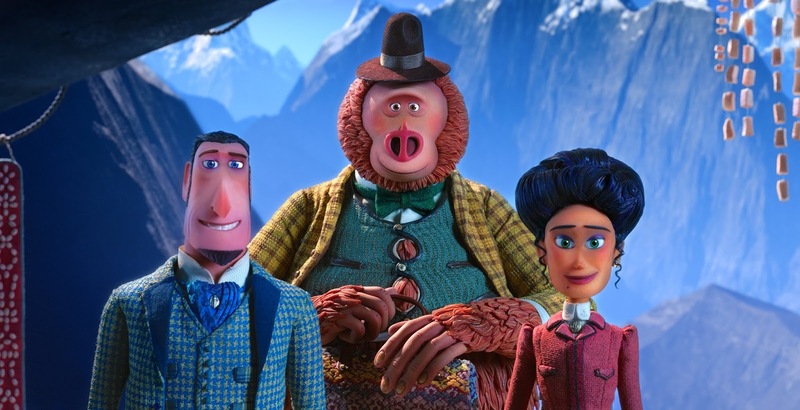 With its nuanced narrative and astonishing visuals, Missing Link is another delightful offering from Laika that continues to demonstrate the studio's dominance in telling stories you'll love that you never knew you needed.